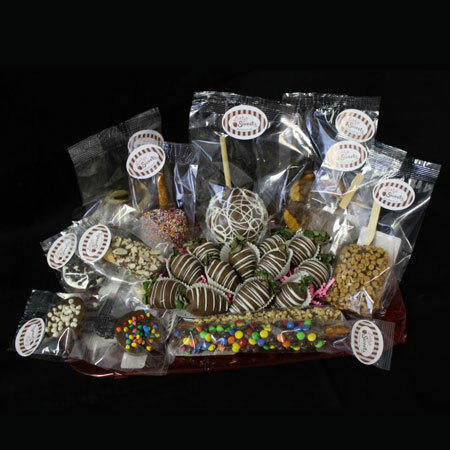 Lehigh Sweets is offering a wide assortment of chocolate covered sweets for your next event or occasion. Try Lehigh Sweets today! Looking for the perfect gift? We can customize a gift basket for you with a combination of our chocolate dipped goodies at unbeatable prices! We can customize each of our delicious offerings to match your party by personalizing our chocolate covered treats! Makes great “thank you” parting gifts and favors! We serve weddings, corporate events, anniversary parties, birthday parties, sweet 16’s, bar mitzvahs, bat mitzvahs, baby showers, or any special occasion. The sweetest way to raise money is with our Chocolate Covered Treats! Lehigh Sweets is the perfect choice! Ask about our fundraising program. Chocolate Sprinkles – Rainbow Sprinkles – Holiday Sprinkles – Seasonal Shapes – Mini Semi-Sweet Chips – Mini White Chips – Cookies-n-Cream – Mini M&Ms&reg; – Rainbow Nonpareils – Holiday Nonpareils – Toffee – Nuts & More!